The Arlington County Board today approved a plan to redevelop a 7.65-acre superblock located along the eastern boundary of Rosslyn’s core into three new blocks with a total of up to 2.5 million square feet of offices, residences, retail, a hotel and public open space. The redevelopment, a joint project of Vornado/Charles E. Smith and Gould Property Company, will occur in five phases over the next 25 years. 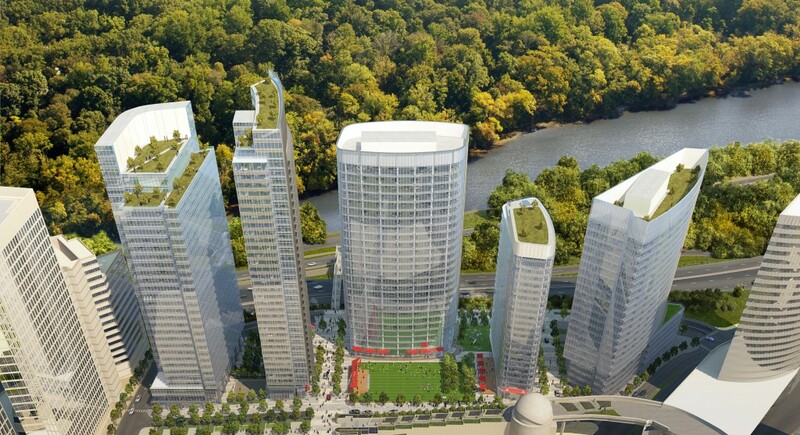 When built out, Rosslyn Plaza will be the largest single redevelopment in Rosslyn. It will offer five new buildings with commanding views across the Potomac River; major public street improvements including two new streets; portions of a planned, vehicle-free Esplanade that will front 1-66, and a new public park — all within walking distance of the Rosslyn Metro Station. The Board voted 5-0 to approve rezoning the site from the “C-O” Mixed Use District and “S-3A” Special District to “C-O” Rosslyn Mixed Use District. The Board voted 5-0 to approve the Phased Development Site Plan. To read the staff report for this item, visit the County website. Scroll down to Item #23 on the Agenda for the Saturday, March 12 County Board Meeting. The project re-envisions the site bounded by 19th Street North, North Kent Street, Wilson Boulevard and North Arlington Ridge Road. The first approved redevelopment since the Rosslyn Sector Plan was adopted in 2015, Rosslyn Plaza will bring a greater sense of place to Rosslyn’s core, and strengthen the connectivity of the street network. Each of the five phases of the Phased Development Site Plan (PDSP) will go through the site plan process for public review, feedback and final approval by the County Board. Each phase will provide new buildings along with public improvements to the street network to transform the superblock into three new blocks. Construct a new street – 18th Street N.
The current Rosslyn Plaza development has seven buildings – four office buildings, two residential buildings and the Spectrum Theater. Built in the 1960s-70s, they are arranged on a superblock that is elevated and physically disconnected from Arlington Ridge Road. The redevelopment plan calls for replacing all of the aging buildings and creating a new destination that provides easy access for transit users, pedestrians, cyclists and motorists. Superblocks, popular in the late 60s, are larger-than-normal city blocks favored at a time when planners sought to separate vehicle and pedestrian traffic. Superblocks often discourage walking and cycling. Under the redevelopment plan, the Rosslyn Plaza superblock will be broken up into three blocks with new two-way streets, running east-west. The streets will connect North Kent Street to North Arlington Ridge Road. A portion of the Esplanade, a 22-foot-wide landscaped, shared pedestrian and bicycle trail facing the Potomac River that was envisioned in the Rosslyn Sector Plan, will be built along the reconfigured Arlington Ridge Road. The Site Plan Review Committee (SPRC) reviewed the proposed Rosslyn Plaza PDSP at 17 meetings from 2012–2015. During this period, the SPRC made suggestions to the developer to revise the Rosslyn Plaza redevelopment plan and integrate the recommendations from the Realize Rosslyn process and eventually from the adopted Rosslyn Sector Plan. The Planning Commission recommended approval of the project at its meeting on March 3, 2016. The County Board adopted the Rosslyn Sector Plan on July 23, 2015, a 25-year plan designed to transform Rosslyn into a more walkable, dynamic urban center and vibrant gateway to Arlington. The Plan provides both a vision and a guide to growth and development in the Rosslyn Coordinated Redevelopment District (RCRD). It was the first in-depth review of the Rosslyn area since the Rosslyn Station Area Plan Addendum was adopted in 1992. Rosslyn is undergoing a major transformation with several site plan projects either under construction or preparing for future implementation. 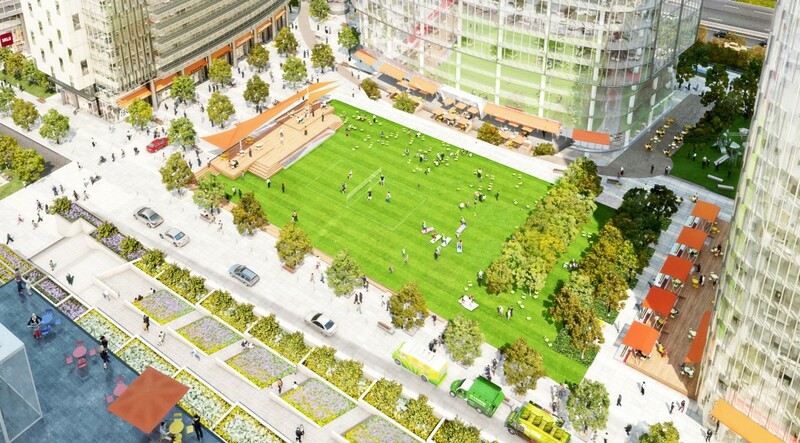 Redevelopment of the Rosslyn Plaza site with five new buildings arranged around publicly accessible open spaces oriented to the core of Rosslyn. Adherence to the Rosslyn Sector Plan’s “Peaks and Valleys” building height recommendations, including preserving the preservation of priority views from the Central Place public observation deck and Freedom Park. Improvements to Wilson Boulevard, North Kent Street, Arlington Ridge Road, and the construction of two new streets. Provision of publicly accessible open spaces including the Rosslyn Plaza Park and portions of the Esplanade. Visit the Rosslyn Plaza webpage for additional information.